As part of the business community, I think it is our responsibility to pass on the lessons we learn from entrepreneurs around us. I think those lessons become even more solid when we teach them to others. 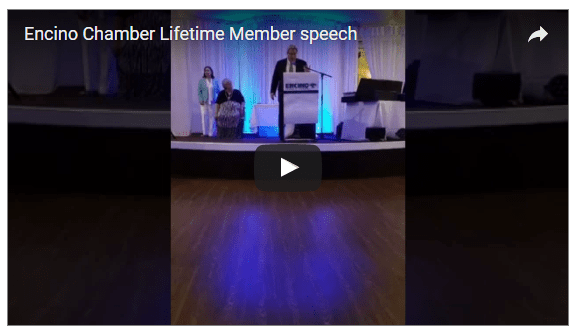 The other night, I received a Lifetime Membership award from the Encino Chamber of Commerce and thought that I would share some of the lessons I have learned from members, who have become lifetime friends. It is a place I constantly learn, teach and learn some more. A few months ago, after driving all the way through Los Angeles to Encino, passing 10 million people, I stopped at our mailbox drop. As I got out of the car, the very first person I saw was Leon Woods. Leon is my banker. Has been for years. As we stood there and shared stories of our parents and our lives, I realized that as a business organization, the Chamber has created a small town inside a very large one. All of us in large or small towns, can create this atmosphere, and we should. Several years ago, local insurance expert Paul Davis and I had our first conversation. We both noticed that each of us had a similar method to dominating our categories in networking groups. We were able to share some of our best practices because we sold different products to some of the same target audiences. Cooperation between entrepreneurs is an important lesson. At the Chamber installation dinner where I was honored, Melody Leblanc ran the silent auction, like she has for years. Do you know how many hours that takes? To gather items, to remind others to gather items, to package them into easily salable gifts, to get them all to the venue, to arrange them, to make sure the items are selling and adjust the prices, to make sure it ends on time, to collect the money and get a report to the board… .and probably a dozen more steps I don’t know. Yet, when you go up to Melody to congratulate her on a job well done, the first thing she does is commend the team around her. She pats them on the back instead of taking the credit. Leadership. That is what we learn from Melody and it’s one of the most important lessons I learned in 25 years of being a member of that chamber. Most of us have no idea what Vahid and Hammed Khorsand do. These brothers have received zero business from the Chamber – their clients are large investment companies. But they learned from their grandparents and parents that when we have a business in a town, we owe it to that town to give back. Getting involved is what business people do. This blends perfectly with the message that Sharyn and I teach each client that hires us as their virtual Chief Marketing Officer: Find a cause – we prefer non-profits – and get involved. We owe it to society to leave it better than we found it. When we are on the road, talking about and teaching marketing to a lot of very different sized groups, we share the story of Stan Goldenberg and WestVal Pharmacy. They are a little independent business that competes monthly, daily, hourly, against much larger chain stores, but they have learned to adapt and thrive. Another one of the lessons we learn from the entrepreneurs around us came to me when I asked Rickey Gelb why he did not charge for parking at the buildings he owned. It seemed like a definite revenue source. His answer was, typical for Rickey, very simple and direct: “My tenants are busy making money doing what they do. Why not make it just a little easier for them by giving them one less thing to think about when one of their customers walks through the door?” He also noted that he was certain that he had more loyal tenants because of it. The lesson: A win-win may not increase your bottom line directly, but there are other places it will show up. And finally, one of the people I met a long time ago, Gloria Pollack, came to mind. It turns out that I was the very first person she met when she came to the city who didn't work at the company for whom she worked. We both attended the same Chamber event and she says that I was the first person to walk up and make her feel welcomed. I remember that day – and I was following my own rule: If they are new, you need to meet them. Gloria is one of those people who always knows the right person and I am so glad that she considers me one of them. Lesson: Stick out your hand and say hello. We are all in business, let’s make it easier for each other. If you want some help getting involved, or figuring out what to do once you have joined, give us a call at (800)705-4265 and let’s talk about it. There are also other blogs and chapters in The Marketing Checklist which talk about networking in more depth.